(CNN) -- April's edition of Living Golf will come from Holywood... No, not Tinseltown but a town in Northern Ireland where golf's biggest box-office ticket Rory McIlroy lives. 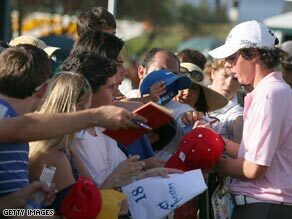 Rory McIlroy signs autographs at the World Golf Championships-CA Championship in Doral, Florida. CNN's Living Golf spends exclusive time with the 19 year old Northern Irishman who tells us about his swift rise to the top and how he is handling comparisons to Tiger Woods. Presenter Justin Armsden is invited back to the McIlroy family home to see where it all started for one of the most exciting talents the game has seen in years. The program will also showcase how Northern Ireland's junior golf foundations have helped locals like McIlroy rise to the top, and what organizations like the Darren Clarke Foundation are doing to maximize the talent pool. Sonic Boom -- Are golf clubs truly deafening? A medical study carried out by a research team at Norwich hospital in the United Kingdom has found that new titanium drivers can produce an ear-shattering "sonic boom" when the club strikes the ball. The sound may be impressive but, according to the study, it's also sufficient to induce temporary or even permanent cochlear damage. Our technology expert Chris Meadows investigates the claims and speaks with the researchers behind the study. Adam Scott teams up with his golf coach Butch Harmon to help us identify the importance of practicing your short game. We also hear why Harmon believes Scott is one of his biggest talents in the game. Professional golfers these days are professional in every sense of the word -- media trained, dedicated, knowledgeable in every facet of the game, and on the whole, lacking much personality. Well, Boo Weekley bucks that trend. The devout Christian would much rather go fishing or spend time at home with his family in Florida than take to the golf course. But, he says golf 'pays the bills' and Weekley now has cult status in the United States, particularly after inspiring the Ryder Cup team to victory last September. We wanted to get to know Boo a little better and CNN's Justin Armsden got the chance recently in Qatar to do just that.